In less than a week, Toronto voters will elect a new city council that, unfortunately, will be much smaller than before. Premier Doug Ford’s decision to slash the city’s municipal representation nearly in half to 25 seats, while the election was already well underway, will have substantial impacts on how Toronto governs itself well into the future. Ward 13, Toronto Centre: First elected in 2010, Kristyn Wong-Tam is one of the best and brightest on council and she deserves another term. She’s more capable of leading this challenging downtown ward than either of the other leading candidates, former Liberal cabinet minister George Smitherman and Lucy Troisi, who broke her promise not to seek election when she was appointed to replace the late Pam McConnell. Ward 14, Toronto-Danforth: Incumbents Paula Fletcher and Mary Fragedakis stood shoulder-to-shoulder in the aftermath of the tragic Danforth shooting and on many progressive issues. But now more than ever Toronto needs an outspoken councillor with a social conscience who is willing to stand up for the city and the most vulnerable within it, and that is Fletcher. Ward 15, Don Valley West: Jaye Robinson has been disappointing as a councillor and even more so as the lead on the city’s road safety plan, Vision Zero. Jon Burnside, a former police officer who represents the other half of the ward, seems to have a solid grasp of the needs of this diverse combined ward. He’s our choice. Ward 16, Don Valley East: Denzil Minnan-Wong can’t be faulted for sticking to his staunch conservative views but the city needs a broader vision than his “keeping taxes down” slogan. The better choice is David Caplan, a former provincial Liberal cabinet minister who left politics in 2011 but is already showing he’s on the right track by pushing to amplify Toronto voices through local citizens’ councils. Ward 17, Don Valley North: Shelley Carroll is a thoughtful and effective progressive voice. She represented this area from 2003 until resigning her seat earlier this year to run unsuccessfully for the Liberals in the provincial election. Carroll brings a wealth of experience, having served ably as former mayor David Miller’s budget chief, and she should be returned to council. Ward 18, Willowdale: After a long political career John Filion was ready to put himself out to pasture, announcing his retirement and endorsing community organizer Lily Cheng as his successor. While he changed his mind when this ward doubled and decided to run again after all, we don’t see any reason to do so. It’s time for a new voice on council and Cheng deserves a chance. 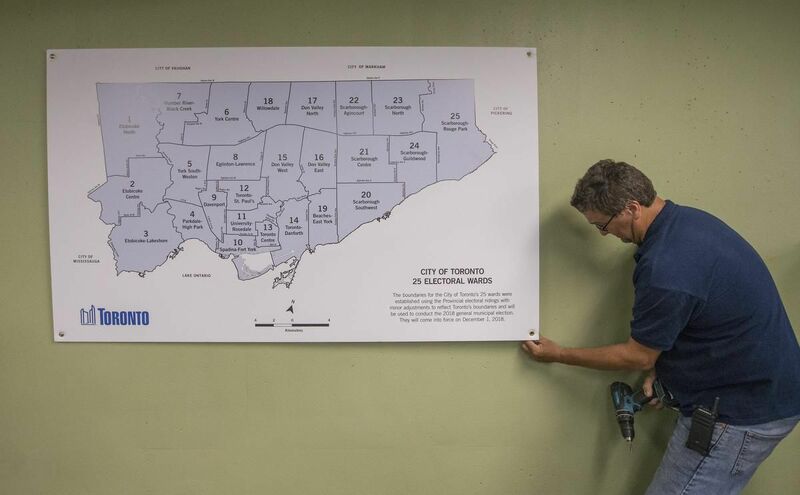 Ward 19, Beaches-East York: This is one of the rare wards without an incumbent. Former NDP MP Matthew Kellway has already served this community and his previous role as critic for urban affairs and transportation makes him well-placed to hit the ground running on some of Toronto’s most pressing issues. Ward 20, Scarborough Southwest: It’s time to replace both incumbents, Michelle Berardinetti-Holland and Gary Crawford, who add far too little to council. A better choice is Suman Roy, a chef with an interest in food security and an extensive resume of community work. He was an impressive presence on the city’s board of health and should be given a chance to show what he can do on council. Ward 21, Scarborough Centre: Michael Thompson is too conservative in his views for our taste and was among the misguided councillors who supported the province’s move to slash council seats. But he works particularly hard for his constituents and should be returned again. Ward 22, Scarborough-Agincourt: We would prefer new blood in this ward but with two incumbents and no particularly strong candidates that’s unlikely. And Norm Kelly is much preferable to Jim Karygiannis, who really must be shown the door. Kelly helped to right the ship during the late Rob Ford’s tumultuous time as mayor and should strive to think big again. Ward 23, Scarborough North: Felicia Samuel has put forward the most compelling campaign in this ward, where there is no incumbent. She’s an elementary school teacher who is active in the community and understands its needs. She would be a welcome new progressive voice on council. Ward 24, Scarborough-Guildwood: Incumbent Paul Ainslie is a principled councillor who has served his ward well. He’s knowledgeable about the issues and willing to be honest with his community on transit, a particularly rare commodity at city hall. He deserves re-election. Ward 25, Scarborough-Rouge Park: Neethan Shan had a lengthy record of community service before he was elected to this ward in a 2017 byelection, after Raymond Cho left to run provincially. In his short time on council Shan has shown he can advocate for his riding and he should now strive to raise his profile on city-wide issues. He’s our choice here.